Balancing Act is a microgame in WarioWare: Twisted!. It is found in Mona's stage. It returns in WarioWare Gold as one of Penny's microgames. The game's objective is to balance an object being held up by a person's finger until the time runs out. 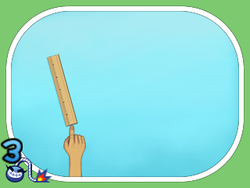 If the player drops the object, the hand will stick all of its fingers out, signaling that they've lost. 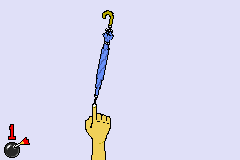 Level 1: A blue umbrella needs to be balanced. Arrows are shown to indicate what to do. In WarioWare Gold, small objects must be balanced. Level 2: A red boomerang needs to be balanced. Balancing it is confusing because of the bend. In WarioWare Gold, medium objects must be balanced. Level 3: A green pencil needs to be balanced. It is shorter and loses balance more quickly. In WarioWare Gold, big objects must be balanced. This page was last edited on October 26, 2018, at 21:53.